Artillery Tanks are the dominant tank on this map. The entire match must be planed around this fact. A commander that wins without emphasizing artillery was either very lucky or very smart. Be sure to research these units as quickly as possible. Then, research extended range artillery cannons. After that, the choices become more flexible. Base defense is key on this map. ML and MG turrets on the ramps overlooking the entrance to your base are key, and consider placing a MG turret on your side of the bridge, close to the entrance, to prevent an early rush. Lastly, place a wall along the entrance, completly blocking it. However, it is essential that you place the wall far enough back so that your tanks can drive over the sides of the ramps onto the bridge. This layout will prevent almost all tank and infantry rushes while allowing you to use the bridge fully. Do not obstruct your half of the bridges with walls or buildings. Your tanks must be able to reach the center of the bridge to defend against the enemy. Many commanders make two bases instead of one. on the north and south sides of the map. Not only are these farther away from enemy artillery, they ensure if one base falls, you can quickly muster support from the other. Do not wall in your CV. Should artillery zero in on it's position, it must be able to move. Otherwise it's a sitting duck. Use many tanks in tandem. 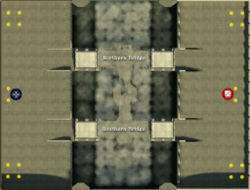 Regular artillery cannons can not reach the enemy base while behind the parapapets of your own base; you must advance onto the bridge. The best way to achieve this is to coordinate your tank attacks. Use artillery to clear your half of the bridge, then send regular tanks to clear out the enemy side of the bridge. AS SOON AS THEY HAVE TAKEN THE BRIDGE, send out artillery onto your side of the bridge to support these units. This combination will allow the artillery to reach strike range of the enemy base. If the tanks on the enemy side of the bridge can reach the wall the enemy has constructed, attempt to breach it via engineers it the tanks have been destroyed at this point. Exploit a breach in the enemy wall. If for some reason the enemy base has an opening, rush it at all expense. If there are many turrets around the opening, artillery will make short work of them. If you are fast enough and well supported by other units, you might even consider taking a jeep through first to distract ML and enemy infantry. Resources are plentiful on this map, as are tickets. Don't hesitate to make the best tank you can, and don't hesitate to rush the enemy in a suicide charge. However, as usual, it's far more effective to work with a squad if you choose to rush. Scouts can be a valuable resource wherever artillery are employed. Be sure to use hide to infiltrate the enemy base. Beware of artillery shots as they will reveal your presence. Find where the enemy is shelling, and sprint past, then hide again. Infantry Rush Early. If you are very fast and a decent shot, choose a Rifleman or a Scout and rush the enemy base as soon as the game starts. Those who are skilled enough to defeat the enemy riflemen attempting to do the same thing to your base will find the only opposition to be engineers who are very distracted by building refineries. A few kills early enough in the game can ruin the enemy build early on and ensure a victory for your faction. It is quite possible to single-handedly win the match if you are quick enough. Disrupt Enemy Spawning, not resources. In almost every case except an early, early infantry rush, targeting the refineries will be a futile gesture, because of the number of resources or the number of extra Refineries at the other edge of the map. Should you have artillery units available or have breached the enemy base, focus on destroying either the Barracks or the VF. Likewise, it's difficult to severely damage the enemy CV on foot, but if you breach the enemy base in a medium or heavy tank, this should be a priority. This page was last modified on 14 September 2007, at 05:54.